Solve More Problems, Make More Money With Judgements & Asset Recovery! As the market continues to change, investors are looking for more ways to make money, maintain strong yields, and concrete relationships with asset management contacts. In this new episode of the DistressedPro Professional Podcast, we talk with two finance experts who may just have a solution which will help investors achieve this. 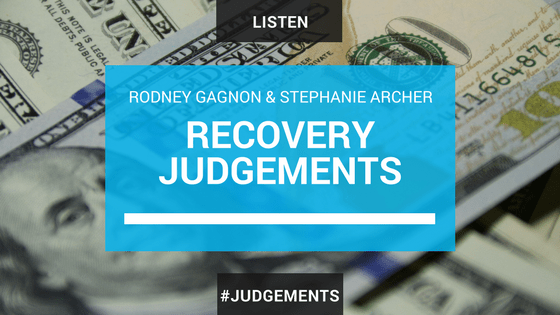 Rodney Gagnon and Stephanie Archer know a thing or two about debt, judgements, and generating cash in asset recovery. They’ve been navigating a commonly overlooked niche, with big dollar amounts up for grabs. They’ve been doing it for over 20 years. Non-performing mortgage loans have exploded in visibility and popularity among investors over the last decade. However, there was a lot more to the credit and foreclosure crisis than residential home loans and REOs. Commercial and consumer debt was at giant levels back then. Much of which has become non-performing unsecured debt. With the last few years being far busier for this type of credit, it could be one of the biggest sectors for debt in the near future as well. There are billions of dollars of this debt. Much of which may no longer be tied to original real estate collateral, or has simply been sitting around, without much action being taken. At least not effective action. A lot of it may have been converted to judgements, but has then just stalled out. Many workout officers and bankers are sitting with this paper on their books and desks. They’d love to do something with it. They just don’t always know what to do, or have the ability to pursue it efficiently. Rodney and Stephanie, have been stepping up to help, and real estate and note investors all over the country could be participating too. Coming from financial investigation and banking backgrounds Rodney and Stephanie are putting their decades of experience to work in enforcing commercial judgements. Using creative strategies and thorough tracing techniques they are able to help creditors turn these dead assets into vibrant new sources of income. Often acquiring portfolios of this debt for just 3 to 4 cents on the dollar, they are collecting millions through garnishments, real estate, tapping offshore bank accounts, luxury vehicles and private planes, and sizable settlements. Most notably; they are able to track strategic defaults and fraudulent transfers, and hold debtors accountable. This episode is packed with tips on how to build stronger relationships and bank on this asset class.